The city and county were named in honor of George Campbell Childress, a native of Nashville, Tennessee, who was the principal author of the Texas Declaration of Independence. The county and city were incorporated more than four decades after Childress's death. In December 2015, the Seattle Post-Intelligencer voted Childress ninth among the ten "most conservative" cities in the United States in regard to political contributions. Other West Texas communities in the most conservative lineup are Hereford (No. 1), Monahans (No. 5), and Dalhart in Dallam County in the far northwestern Texas Panhandle (No. 8). Princeton in Collin County north of Dallas ranked No. 2. In contrast, Vashon Island, Washington was named the "most liberal" city in the nation in terms of political donations. Childress developed from two rival townships, Childress and Henry, which were about four miles (six km) apart on the former OX Ranch. Childress County was organized in February 1887 with the arrival of the Fort Worth and Denver Railway. An election was held on April 11, 1887 to determine which town would be the county seat with Childress prevailing. A temporary wooden courthouse was constructed under the supervision of the prominent attorney Amos J. Fires. However, the Donley County court, to which Childress County was still attached for judicial purposes, declared the election illegal. R. E. Montgomery, the right-of-way and townsite agent for the railroad, favored the Henry location because it had a smoother terrain than Childress, a situation which would make the erection of a depot easier. Montgomery had also purchased half of the property in Henry. When Henry was chosen county seat in another election, Montgomery and Fires compromised. 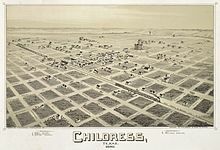 The name of "Henry" was simply changed to "Childress", and the businesses and residences were relocated by September 1887. The railroad built the Dwight Hotel, the section house, and the depot. The Childress Lumber Company followed. J. H. Christler became the first practicing physician in Childress. Amos Fires was elected county judge, a combined judicial and administrative position. He opened the first bank and initiated the county's public school system. In 1888, James S. Harrison launched the Childress County Index (later Childress Index), the first newspaper in the community. By 1889, Methodist, Baptist, Presbyterian, and Church of Christ congregations had been organized. The city was incorporated in 1890 with a population of 621. It had a post office, a restaurant, a livery stable, a boardinghouse, three stores, a Young Men's Christian Association facility, and a theater. There were also several saloons in Childress until 1904, when a fatal shooting prompted Childress to adopt local prohibition of alcoholic beverages. The large Childress Hotel operates with limited clientele. In 1901, when the Fort Worth and Denver City railroad began considering Childress as a division point, Childress voters approved bonds and donated land to build shops and terminal facilities. These businesses, in addition to the influx of farmers and homesteaders, provided more jobs and resulted in a considerable increase in population—to 5,003 by 1910. Future automobile tycoon Walter P. Chrysler served as general foreman of the Childress railroad shops from 1905 to 1906. He then relocated to Iowa, where he worked as a master mechanic before he founded Chrysler Motor Corporation. After a fire destroyed the first Childress County courthouse in 1891, a new stone building was constructed and used until 1939, when the present structure was built. On the courthouse grounds is a memorial to 20th century military veterans, a tribute paid in many Texas counties. For decades, a large windmill on Main Street provided municipal water. The railroad remained the economic center of Childress into the 1940s. Extension of the Fort Worth and Denver railroad to Pampa, the seat of Gray County in the Panhandle, ameliorated the hardships of the Great Depression in Childress. In 1941, citizens appealed to the Interstate Commerce Commission to stop the railroad from closing its shops in Childress. In the 1920s a brick high school building was completed. In 1929, the Childress News appeared in competition with the Childress Index. In 1942, the News was leased by the Index. In 1947, the Childress Reporter was established. After the depression and Dust Bowl era, modern farm machinery and improved highways reduced the rate of growth in Childress. The population was 6,464 in 1940. The railroad closed several shops, which were eventually razed. Lanchart Industries, Royal Park Fashions, and Fiberglass Corporation of America supplanted the railroad as the economic anchor of Childress. The population decreased from 6,399 in 1960 to 5,817 by 1980. Childress remains an agribusiness center with cotton gins and grain elevators. 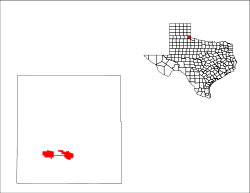 The first successful oil well in the area was not drilled until 1961. According to the United States Census Bureau, the city has a total area of 8.3 square miles (21 km2), of which 8.2 square miles (21 km2) is land and 0.04 square miles (0.10 km2) is water. Childress is bordered on the west by Hall County, on the southeast by Hardeman County, on the northeast by Harmon County, Oklahoma, on the north by Collingsworth County, and on the south by Cottle County. Childress is situated 110 miles (180 km) from Amarillo on the west, 155 mi from Lubbock, Texas to the southwest, and also 110 miles (180 km) from Wichita Falls on the east. It is situated at the intersection of United States Highways 287, 62, and 83, which extends from Brownsville to Laredo in South Texas to North Dakota. Because of its location, Childress is known as the "Gateway to the Panhandle". Childress is only a few miles from the Oklahoma state boundary, but because of the routing of Highways 83 and 62, the one-way drive to Hollis is about thirty miles. The area surrounding Childress is popular with hunters for quail, deer, dove, and wild hogs. Baylor Lake, located nine miles (14 km) to the northwest, is known for bass fishing. As of the census of 2000, there were 6,778 people, 2,116 households, and 1,369 families residing in the city. The population density was 821.8 people per square mile (317.2/km²). There were 2,554 housing units at an average density of 309.7 per square mile (119.5/km²). The racial makeup of the city was 64.52% White, 15.65% African American, 0.34% Native American, 0.34% Asian, 0.06% Pacific Islander, 17.13% from other races, and 1.96% from two or more races. Hispanic or Latino of any race were 22.37% of the population. There were 2,116 households out of which 31.3% had children under the age of 18 living with them, 48.9% were married couples living together, 12.6% had a female householder with no husband present, and 35.3% were non-families. 32.8% of all households were made up of individuals and 18.0% had someone living alone who was 65 years of age or older. The average household size was 2.37 and the average family size was 3.01. In the city, the population was spread out with 21.7% under the age of 18, 13.1% from 18 to 24, 31.3% from 25 to 44, 18.3% from 45 to 64, and 15.6% who were 65 years of age or older. The median age was 36 years. For every 100 females, there were 147.7 males. For every 100 females age 18 and over, there were 157.6 males. The median income for a household in the city was $26,536, and the median income for a family was $33,323. Males had a median income of $25,365 versus $19,442 for females. The per capita income for the city was $11,708. About 14.6% of families and 18.6% of the population were below the poverty line, including 29.5% of those under age 18 and 10.2% of those age 65 or over. Republican Drew Springer, Jr., a businessman from Muenster in Cooke County, has since January 2013 represented Childress in the Texas House of Representatives. The Texas Department of Criminal Justice (TDCJ) operates the Childress Distribution Center and the Roach Unit in two locations in Childress. The United States Postal Service operates the Childress Post Office. Fair Park, with a lake and fountain, offers picnicking facilities, walking trails, playground equipment, and a swimming pool. The park contains an historical marker for the Goodnight Trail, a westward extension of the Goodnight-Loving Trail, over which cattle were driven to market late in the 19th century. Fair Park Auditorium is located at the entrance to the city park. Nearby is the stadium for the Childress High School football team. Across from the First Baptist Church at C and Third streets, the Childress County Heritage Museum is housed in a former post office building constructed in 1935. The museum includes displays of the cattle, cotton, and railroad industries, area Indian artifacts, and period rooms. The museum maintains a display of the Childress Army Airfield, which operated during World War II prior to the establishment of the United States Air Force. Like many other Texas communities, Childress holds an annual Old Settlers' Reunion. Initiated soon after the establishment of Childress, the reunion, held in July and features a nightly rodeo. In June, Childress hosts the annual Greenbelt Bowl football classic, a contest between selected high school all-stars from the tri-state area of Texas, Oklahoma, and New Mexico. Childress is served by the Childress Independent School District which operates an elementary school (grades PreK to 5), Childress Elementary School, middle school (grades 6 to 8), Childress Junior High School, and a high school (grades 9 to 12), Childress High School. The high school athletic teams are known as the Bobcats. The primary school color is blue, with secondary colors of white and red. The football team plays in a stadium in Fair Park. Basketball teams play in a gym on high school campus and the baseball team plays on their field located between the campus and Fair Park. Clarendon College, a two-year community college, maintains a campus in Childress. Texas Chainsaw Massacre film - Childress is mentioned in the movie as the location with the nearest pay phone. Brokeback Mountain book and movie - In both the movie and the book, Childress serves as the location from which Jack Twist's wife, Lureen, hails. American Pickers television show - In the episode Law & Hoarder, the show visits a local attorney and picks through his warehouse of memorabilia. Hell or High Water film - Although the movie was not filmed in Childress, much of the action surrounding the story and characters takes place in Childress. Minnie Lou Bradley, matriarch of Bradley 3 Ranch in Childress County and a pioneer in the breeding of Angus bulls with Hereford cows. Walter Chrysler, founder of Chrysler Motor Corporation, lived in Childress from 1905 to 1906. Lou Dobbs, radio host and former anchor and managing editor for CNN's Lou Dobbs Tonight and now a FOX News Anchor. Margaret A. Edwards, educator and librarian. Roy Furr, founder of Furr's grocery store and cafeterias chain, lived in Childress County as a youth and worked with his father in Kirkland. Bubba McDaniel, mixed martial artist fighting for the UFC. James "T" Jones, Texas quarterback and Texas Tech Athletic director. The steeple of the First Baptist Church of Childress (pastor Chad King) can be seen throughout the city. The Childress County Heritage Museum is housed in a former post office building across from the First Baptist Church. Sign on Highway 287 directs motorists into downtown Childress. Since the 1950s, the Trade Winds Motel has hosted hunters, truckers, and Colorado-bound vacationers. Clarendon College offers two-year courses in Childress. ^ "City of Childress, Texas | Your Government". City of Childress, Texas | Official Website. Retrieved 2019-01-08. ^ "NowData – NOAA Online Weather Data". National Oceanic and Atmospheric Administration. Retrieved 2018-03-07. ^ "Station Name: TX CHILDRESS MUNI AP". National Oceanic & Atmospheric Administration. Retrieved 2018-03-07. ^ "Childress Distribution Center Archived 2010-07-11 at the Wayback Machine." Texas Department of Criminal Justice. Retrieved on May 22, 2010. ^ "Roach Unit Archived 2010-07-25 at the Wayback Machine." Texas Department of Criminal Justice. Retrieved on May 22, 2010. ^ "Post Office Location - CHILDRESS Archived 2012-06-12 at the Wayback Machine." United States Postal Service. Retrieved on May 22, 2010.